Use Seasonal Trading... Eliminate Stock Selection Guess-Work! "Dow Jones Seasonal Trading Method Shows You Profitable Trends... Years In Advance!" a single dollar to a trade." You've read about many technical analysis techniques on the Stock-Charts-Made-Easy.com Web site. You've seen many of those techniques put to work each month in the Chart Wealth newsletter. Now, find out how this simple technique can explode your profits... giving you the trading edge you need. The seasonal trading method is designed to put you on the right side of the trend, whether it's up or down... in some cases, a staggering 95% of the time! So, why are most traders not aware of seasonal trading? Why are investors throwing away their hard earned capital when they could be banking huge gains? In all probability, you're overwhelmed by all the indicators, oscillators and technical analysis techniques thrown at you each and everyday. Is it any wonder you overlooked seasonal trading... one of the most powerful stock filtering methods ever discovered. With the seasonal trading method, you no longer have to be one of the misinformed traders. Take advantage of this powerful trading technique, immediately. First, the seasonal trading method is derived from an objectively calculated mathematical formula. Once the values are compiled and charted, the seasonal trading trend appears with crystal clarity! You're told this stock trends higher from January through May... better than 9 out of 10 times! You're also shown it posts an average gain of 11% during this time. Incredible! The stock was up a whopping 31.6%! OK. You're thinking this was an exceptional year. Granted, most stocks were up sharply, pushing their indices to record gains. But, what about a short sell in the same year? Look at the seasonal trading chart, again. You see from May through September the stock trends down 70% of the time... falling an average of 4%. 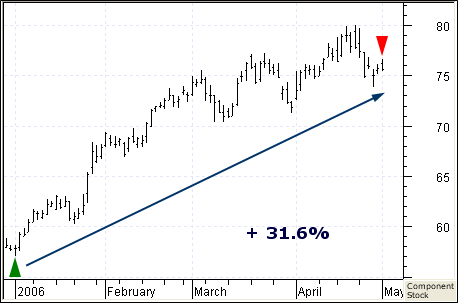 Would you have made a profit selling this stock short after such a strong uptrend? Yes! 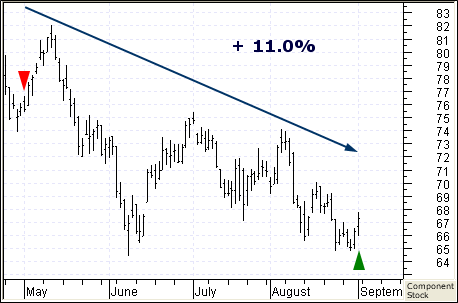 The stock trended down as predicted... gaining 11% on the short sell. The numbers speak for themselves. A picture truly is worth a thousand words! ...all the information you need to make an INFORMED trading decision. All right. Will you make incredible gains on every trade? The seasonal trading method isn't foolproof. Looking at the seasonal chart, the forecasted uptrend from October to December didn't materialize... serving a -4.5% deficit. But, are you going to blindly enter every trade? You'll want to use the seasonal trading method as a filter before applying your favorite technical indicators and trading methods... done with greater precision and accuracy. You'll know when to take a trade and when to sit on the sidelines, preserving your hard earned capital for another day. Over 20 years worth of statistical data... painstakingly compiled and analyzed for each seasonal trading chart. More than 150 data-packed pages of seasonal trading opportunities! "What Else Can Seasonal Trading Do For You?" 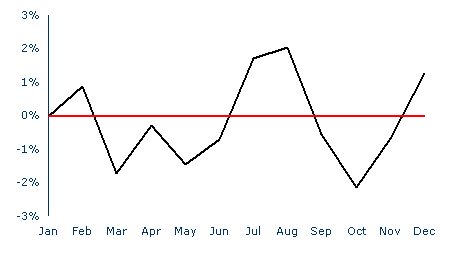 Here's an additional chart that can help clarify the seasonal tendency of the stock. This chart represents the stock's seasonal relative performance compared to its index. Note: In this case the stock outperforms its index through the entire seasonal cycle. If the seasonal trend diverges from its seasonal relative performance... it's like a flashing red light telling you to stop, then proceed when it is safe to do so! This information is critical to your trading plan. You've read the statement, "Past performance does not predict future performance." But, past performance will show you a stock's bias or tendency to trend up or down. It's crucial to see how a stock has performed in the past before committing precious trading capital to it. 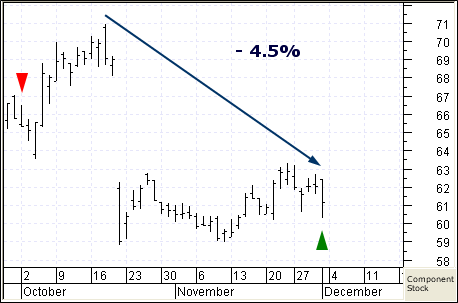 This is clearly illustrated in the seasonal trading simulations provided with each study. 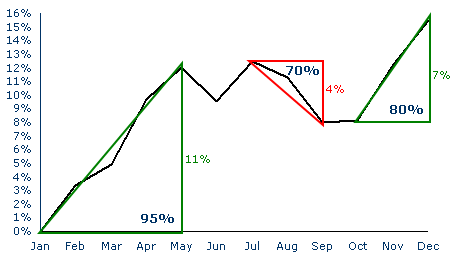 The seasonal return is almost double what the buy and hold simulation produced... at a hefty gain of 47%! "Why The Dow Jones Industrial 30?" The Dow Jones Industrial component stocks represent the best US big business has to offer. All are heavily traded, providing superior liquidity to the market. These companies are so well managed and diversified, they present little risk to the average investor... perfect for seasonal trading. You own or plan on owning any of the 30 component stocks of the Dow Jones Industrial Average. You use "Dogs of the Dow" as a trading strategy. You are reviewing your portfolio and re-allocating stocks. You are looking for a stock filtering tool that will give you an unfair advantage in the markets. You are not happy with your broker's recommendations. You are searching for a quick, easy guide to get you in and out of a stock at the right time. You want a method that will pay for itself in the first trade. You are ready to reduce your losses and bank huge profits. You want an ironclad guarantee that removes any risk from obtaining this information. One stock gained 38% this past year. Another stock lost over 53%! Imagine if you knew these seasonal trading results ahead of time. What would you do with this kind of knowledge? This incredible book includes all 30 Dow Jones Industrial Average component stocks... analyzed for their seasonality, relative performance and strength within the index. Each seasonal trading chart shows you the trend probability (70% or greater), as well as, the likely percentage movement for the trend. Additionally, there is a trade summary simulation based on over 20 years of price data for each seasonal trend. This can be compared to the buy and hold simulation for the same time period - also included. Finally, if you like "crunching" your own numbers, there are two data tables for each stock. The first depicts the average monthly price of the stock. 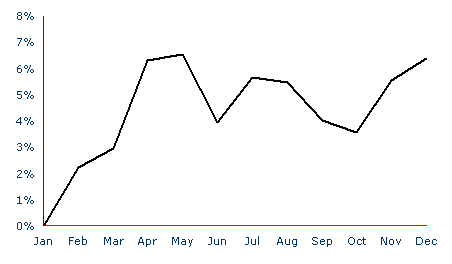 The second shows the monthly price as a percentage of the annual average. Nothing worth doing is without risk. ...does not deliver everything you want and expect, simply tell us you want your money back. That's more than a guarantee. "You will profit at least 10 times your purchase price within two years, or we'll refund triple what you paid for Seasonal Stock Trading." You read that right... triple your money back if you fully use the strategies of the seasonal trading method over the next two years and you don't bank at least 10 times your purchase price according to the simple instructions. Take control of your trading plan, now. With seasonal trading, you'll consistently pinpoint leading stocks with startling accuracy... changing your trading habits forever. Isn't it time to get the trading edge you've been looking for? It should not be assumed the technical indicators, analysis techniques or trading methods presented will be profitable or that trading decisions based on their use will not result in losses. Past results are not necessarily indicative of future results. Examples presented are for educational purposes only. Any trade set-up illustrated is not a solicitation to buy or sell a security. The author, publisher and any affiliate linked to this product assume no responsibility for your trading results. Remember... there is a high degree of risk in trading.